The languages of Bangladesh, of course. Bengali Here is the map in Bengali..
My goal is to create integrated maps, maps intended to be read alongside the text, highlighting important places mentioned in the article. Will work together with the accompanying article. The purpose of an integrated map is to provide context for placenames and other information in the article. Will be sharply defined and clear when viewed within the article. Too many maps in Wikipedia are shrunken so small or drawn with so much detail that they cannot be read or understood from the article. Will have colors based on the semi-official ones at Wikipedia talk:WikiProject Maps. Will not require a magnifying glass and maxi-zoom to read the details. Like a Wikipedia article, a map can be improved by leaving out information/data. Will be easy to interpret. While large comprehensive maps have their own encyclopedic uses, they do not work well as a guide to places and other information in the article -- editor will almost always reduce that map's size to the point where it requires the visitor to click to another screen just to read it. But then the map is divorced from the text and the visitor can no longer easily locate places. She will usually just give up rather than click-and-load back-and-forth. An integrated map, on the other hard, can be read from the article itself. This allows the visitor, as she reads thru the text, to locate the various unfamiliar placenames on the map and then go back to reading with a quick eye movement (and repeat down the page). I am also a fan of Edward Tufte and I think it's important that maps (or any visual informative media) are clean and easily understandable, with little if any window dressing. This does not mean, however, that maps should be drab. Au contraire. I use Inkscape to create my maps. I believe that SVG is the best format for maps, although the font support here in Wiki-land is poor (see discussion here). I try to work on the requests at w:en:Wikipedia:WikiProject Maps/Requested and orphan maps, but you certainly may leave a request on my Talk page. I would be very happy to translate any of my maps into another language. The Battle of the Gebora, part of the Napoleonic wars. The covering of the Senne, during the late 19th century. The eruption of Mt. Vesuvius in the year 79, with English names. -- > The same map, with Latin names. The eastern Mediterranean Sea in 1450 CE. The disasterous maiden voyage of the Vasa. Although I like the simplistic beauty of this map, it lacks some pizzazz. The Crusader states (in shades of green) and other nation-states of the Levante in 1135 CE. The Baltic tribes, circa 1200 CE. The Eastern Balts are shown in brown hues while the Western Balts are shown in green. The boundaries are approximate. Commissioned by Renata3 and Xil. Perhaps my best geographic map, showing the ancient Greek colonies on the north shore of the Black Sea. The Duchy of Courland & Semigallia in 1740. The Guidicati (indigenous "kingdoms") of Sardinia, from about 1000 until 1410. Qui è una versione di lingua italiana. A map of southern Italy showing the important cities and states during Roger II of Sicily's reign (1112-1154). A recent map showing the theatre of operations and troop movements leading up to the Battle of Seminara. This map was commissioned by Attilios. This map shows the important cities, towns, and battle sites of the Swiss Peasant War. The light brown lines show the canton borders as they appeared in 1653. Instead of literally showing the Emmetal and Entlebuch valleys where the revolt began, I used the red starburst to highlight the area. Commissioned by Lupo, who took this map and actually improved it (the nerve)! You can see his improved map here, as well as a very nice second map that he built using the 1st. Italy in 1000 CE, part of my series of historical maps of Italy. This map may be too "busy". Italy and the eastern Adriatic in 1084 CE, part of my series of historical maps of Italy. Italy in 1494, before the invasion of Italy by Charles VIII of France. that year. This is a map of Italy just before the Napoleonic wars. As perhaps you can tell, I'm quite a pushover for fancy fonts. This is a map of Italy during the last years of the Napoleonic era. Vsepovsod je a prevod po Slovensko. A map showing the barbarian invasions of the Roman Empire. *Voici la version française: Image:Grandes Invasions Empire romain.png. *Here it is in Arabic: Image:Invasions of the Roman Empire Arabic.svg. My first map here that used little icons on the map itself. Does it work? You tell me. I'm not completely happy with the outcome, but it does make for an interesting map. *Hier ist die deutsche Version. Here I used a gradient to show the Levant, hopefully implying the fuzziness of the definition. The genial NormanEinstein supplied the base map. Norman is among the best (or perhaps is the best) geographic mapmaker here in Wiki-land. A full map of Anatolia in 1097. The following maps do not contain any labels. Such maps are useful under some circumstances, but the general geographic area must be recognizable to the average reader. The disadvantage, of course, is that these maps are less informative, but such maps can be useful in a multi-language encyclopedia. Duchy of Courland and Semigallia in 1740. The Duchy of Naxos, also known as the Duchy of the Archipelago, in the year 1450. Image:Danishmend 1097, locator map.svg‎|A map showing the lands of the Danishmends in 1097. Here are three maps intended to show particular sites. 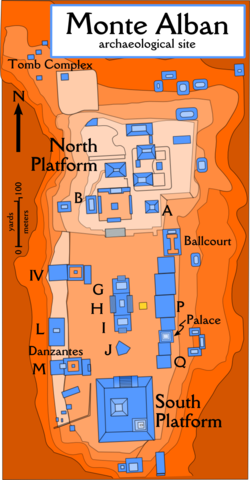 Here's a map of the Monte Albán archaeological site. I attempted to show the elevation of the site (it's built on an artificially-flattened mountain top) through the use of increasingly light colors. The site plan for the Olmec La Venta archaeological site in w:en:Veracruz, w:en:Mexico. I built this map using Image:Plano La Venta.svg created by the wonderful Yavidaxiu. The "source code" for this image can be found at Image:La Venta Site Plan.svg, but the SVG interpreter here in Wikipedia could not handle the fonts I've used and has inserted other weird-osity, so I uploaded it as a PNG file. A map of Central Park, New York City. I generally prefer historical maps, but I was asked nicely.